(Left to right) Dorine Poelhekke and Sanne Castro of SimGas, with Dr. Kamau Gachigi, founding executive director of Gearbox at ISHOW Kenya. 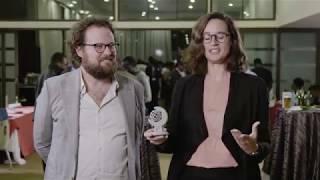 Nine teams of social entrepreneurs from across Europe and Africa gathered in Nairobi earlier this month to compete in ASME’s 2018 Innovation Showcase (ISHOW) Kenya. With projects at stages from early prototype to machines for manufacture, they shared solutions to problems in healthcare, small-scale energy production, agriculture and food storage, and barriers faced by people with disabilities. One of the three winning teams at the ASME ISHOW Kenya, held May 9-11 at the Azure Hotel, was from the Dutch company, SimGas, which is developing a milk chiller powered by biogas. SimGas systems allow rural households in developing regions to generate clean fuel and fertilizer from manure. SimGas’s Biogas Milk Chiller is designed to prevent spoilage when small-scale, off-grid dairy farmers store milk overnight before delivering it to local processors. “We’ve put a lot of dedication and sacrifice into designing our hardware, and we are really grateful for this recognition,” said Ishmael Hezekiah, chief operating officer of Bentos Energy. Bentos makes and distributes low-cost, smokeless charcoal briquettes from waste materials and biomass, including water hyacinth, an invasive plant species. Hezekiah and his team at Bentos are proud they can provide jobs, reduce landfill, and cut air pollution. Bentos reports there is a monthly demand for 200,000 bags of their briquettes in Kenya, but the company needs to buy equipment to generate that output. “The acquisition of fabrication machines is paramount,” said Bradley Mbagaya, Bentos’ technical manager. “So that is the first thing we are going to do, so we can increase our capacity.” The $10,000 from the ISHOW will go towards the $500,000 Mbagaya and Hezekia say Bentos is trying to raise for manufacturing equipment. (Left to right) Iana Aranda, president of Engineering for Change (E4C), with ISHOW winners Bradley Mbagaya and Ishmael Hezekiah of Bentos Energy. Chege and his business partner, William Muthoka, teamed up several years ago to raise chicks, something they thought would be relatively easy. Instead, they discovered regulating temperature was important and difficult, requiring 4:00 a.m. trips to the coop. They developed Smart Brooder to automate the process. The team believes their product will help young people find work and that it will help farmers shift from charcoal to electricity and cleaner sources of energy. (Left to right) George Chege and William Muthoka of Smart Brooder accepting the ISHOW trophy from Paul Belknap, COO of Killgro Kenya. James Creel, ISHOW Kenya lead, was the on-site host for the event. Featured speakers included Iana Aranda, president of Engineering for Change. Noel Wilson of Catapult Design spearheaded design consultations for all nine competing teams. Judges and Kenya partners included Dr. Kamau Gachigi, founding executive director of Gearbox, and Robert Karanja, CEO of Villgro Kenya. The next event, ISHOW U.S.A., will take place June 21-22 at the District Architecture Center in Washington, D.C. Visit ThisIsHardware.org to learn more.